Wolfgang Amadeus Mozart. Very Good. In very good packaging. 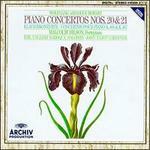 Mozart: Piano Concertos Nos 20 & 21 (K466 & K467) /Bilson · English Baroque Soloists · Gardiner.